Most of the known RNA viruses are from birds and mammals, which represent a small proportion of more recent vertebrate diversity. This omission has been corrected by the discovery of new RNA viruses in hosts that lie across the entire evolutionary history of the vertebrates. 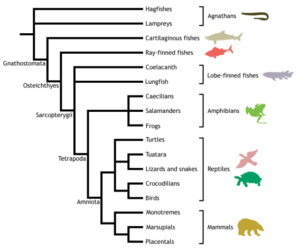 Over 186 host species representing the phylogenetic diversity of vertebrates were sampled, including lancelets (chordates, but considered invertebrates), jawless fish, cartilaginous fish, ray-finned fish, amphibians and reptiles – all ancestral to birds and mammals (illustrated – image credit). RNA was extracted from multiple organs and subjected to high-throughput sequencing. Among 806 billion bases that were read, 214 new viruses were revealed. The results show that, in vertebrates other than birds and mammals, RNA viruses are more numerous and diverse than suspected. Every viral family or genus of bird and mammal viruses is also represented in viruses of amphibians, reptiles, or fish. Arenaviruses, filoviruses, and hantaviruses were found for the first time in aquatic vertebrates. The genomes of some fish viruses have now expanded so that the phylogenetic diversity is larger than in mammalian viruses. New relatives of influenza viruses were found in hagfish, amphibians, and ray-finned fish. For many of the viruses found in reptiles, amphibians, and fish, the tropism was similar to that of mammalian counterparts. Analysis of these new viral genomes also shows that the phylogenetic history of viruses mirrors that of their hosts over very long evolutionary timescales. For example, viruses from fish are ancestral to viruses in amphibians, reptiles, birds, and mammals. Nevertheless, there are many examples of viruses that have switched hosts. One is an influenza virus of ray-finned fish, which is most related to mammalian influenza B virus. How this switch might have occurred is not known, but is fascinating to speculate about. The new RNA virus genomes show greater variation in architectures than previously appreciated. Differences from known viruses were found in genome length, organization of open reading frames, changes in the order and number of glycoproteins, and even number of segments – two arenaviruses were found in fish with three RNA segments instead of two. Arenaviruses with three RNA segments have been found in arthropods, suggesting an evolutionary decrease in segment number (but not gene content) from three to two. These findings show that vertebrate RNA viruses evolved with their hosts, beginning with their emergence in the oceans hundreds of millions of years ago. But viruses were surely on Earth much earlier than vertebrates – perhaps even before there were cells.